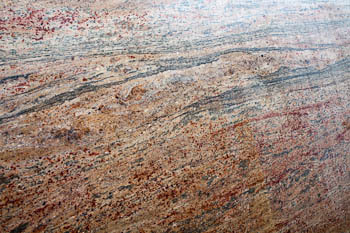 Lady Dream Granite: Not Your Typical Kitchen Granite. 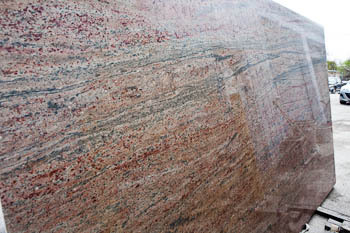 This slab of Lady Dream granite is destined for a kitchen in Northwest Austin. The depth and variation in the color is so stunning that it needed to go up on the website. Lady Dream is red. And salmon. And green. And has hints of blue-green. The undertones are a rich caramel, sometimes with more ivory, sometimes not so much. And these colors are deep, and vibrant. And they come out of the ground looking just like this! 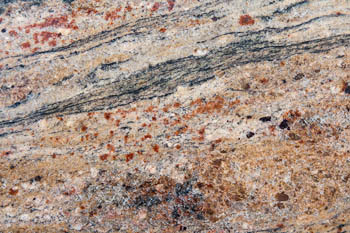 This granite looks smashing on white cabinets, or on almost any color of natural wood. It needs soothing paint colors on the walls, to keep the focus on the gorgeous coloration in the granite itself. It needs a few punches of color on the walls for decor – maybe a few framed prints like a gorgeous orange poppy with a white mat and a black frame. Or a series of prints like that. Lots of little things will just look too busy when the counters have this much color and variation all on their own. You can see from the photo of the whole slab how the sizes of the speckles and lines compare to the over all size of the granite slab (which is about 128-inches by 76-inches). You can also see that the lines move horizontally across the face of the stone, but also go upwards a bit on the diagonal. 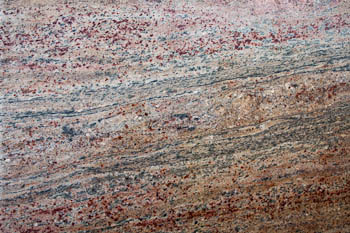 When granite has strong linear movement like the movement this colorful granite, it looks best in galley kitchens. Galley kitchens have long, straight counters, without L-shaped corners. 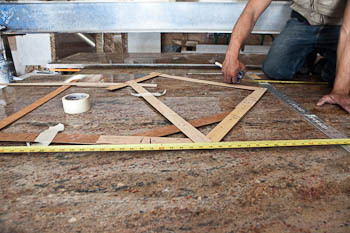 When a kitchen has L-shaped corners, the lines in the stone meet perpendicularly – just like an L.
We had a little meeting when the second slab was up on the saw bed – to make sure that one of the joints was as good-looking as it could possibly be. Our master cutter is picky about this stuff – if he doesn’t see the “right” cut to make it come out beautifully, he’ll call for another opinion. 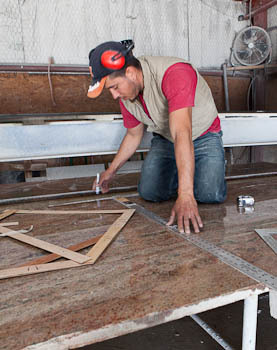 The little strips of wood you can see on the slab are the templates for the counters. This kitchen has a bend in one end, and we wanted to make sure the movement in the granite looked good across the joint. We moved the templates around and marked carefully on the stone before running it through the saw.